Call me a sushi snob, but the name Sushi Sushi conjures up images of fat rolls with names like firecracker, WeHo, or something else equally ridiculous. 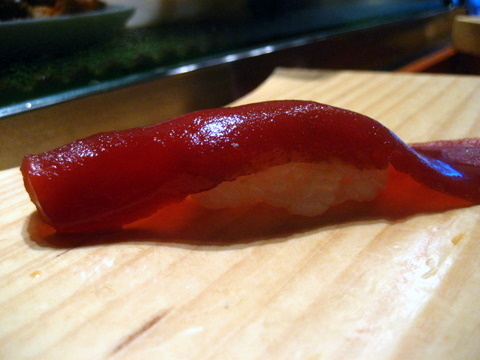 However the place caught my eye when it was rated the third best sushi restaurant in LA on Yelp. There are some yelpers that I'd trust only as as far as I could throw, but their collective wisdom seems to get things right more often than not; Urasawa and Sushi Zo are the two restaurants rated higher than Sushi Sushi. 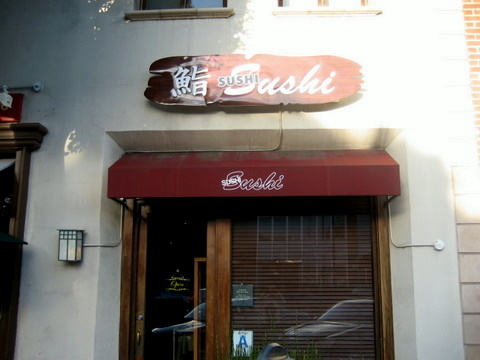 From the outside, Sushi Sushi looks like any other small sushi restaurant, wood and glass facade, awning, and sign. The interior is dominated by a long bar of polished wood though there are a handful of tables for diners who are so inclined. The sushi bar is a darker wood and covered with a layer of varnish giving it a glossy feel and reflective sheen, none of the fine grain texture of the cedar bar at Urasawa. 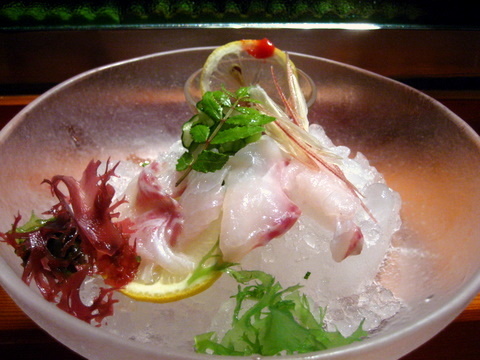 The meal started with thin slices of sea bass sashimi served with a ponzu sauce. 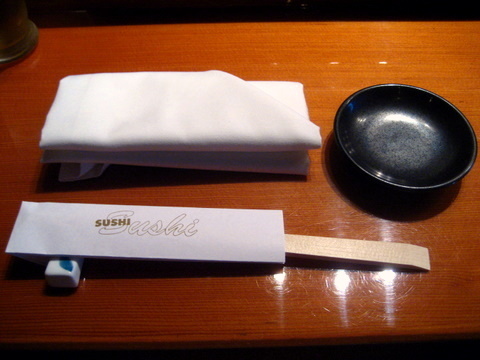 The suzuki was a good choice, clean and light it was a great way to ease into dinner and bed of ice served to chill the fish accentuating its supple texture. 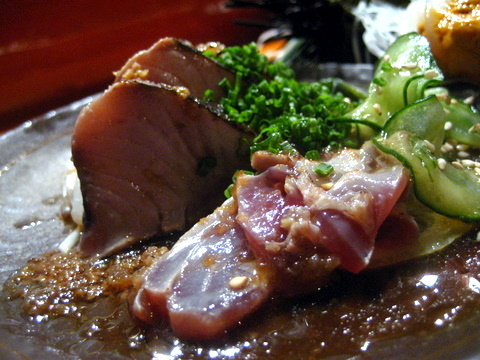 Bonito Tataki - The fish was lightly seared, which added a light smokiness and seemed give the fish a shade of the umami flavor the dried flakes are known for. 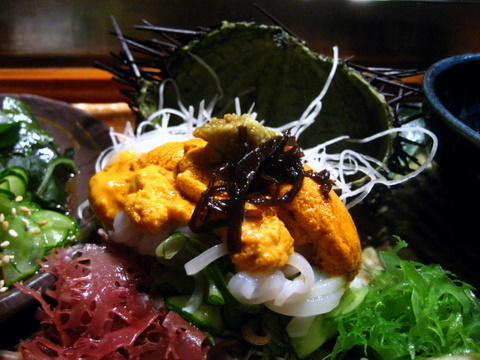 Uni and Ika - This same course is served at Sushi Zo which makes for easy comparisons. The uni wasn't quite as fresh, with a muted bitterness on the finish but the squid was exemplary, extremely soft, if I didn't know any better I would have sworn it actually was noodle. 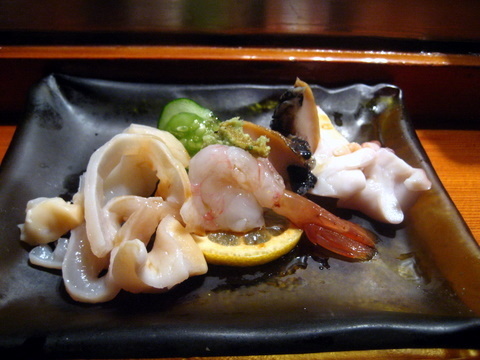 Ankimo - The liver felt gritty and carried a slight metallic tang. My last few experiences with monkfish have all been subpar, maybe I am letting my experiences with foie gras terrine color my expectations for ankimo. I couldn't tell much of a difference between the marinated tuna and standard maguro dipped in soy except that the shoyu flavor was more apparent. 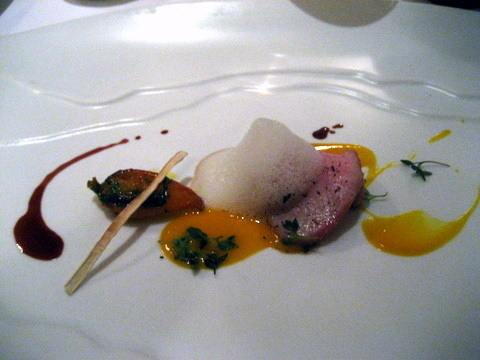 Texturally this was a textbook piece of tuna, soft even texture with no tendon or gristle. The rice was slightly warm and could have been compacted a bit more tightly, it was difficult to pick up the entire piece without having the rice fall apart. The salmon came particularly cold, making for a nice temperature contrast with the warm rice. 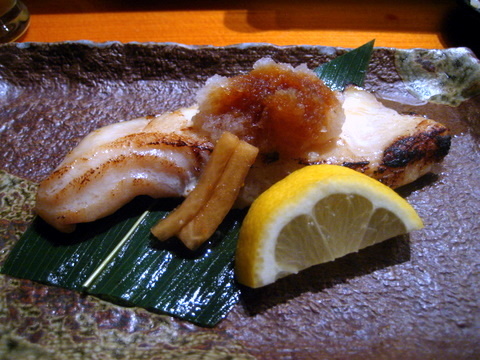 The fish itself was extremely soft with a pronounced butteriness that lingered on the tongue. One of the most powerfully expressive pieces of salmon I have had in a long time. This was something of a rarity for me, as I usually eat either maguro or o-toro, that and many restaurants don't serve Chutoro or don't bother to distinguish it from O-Toro. The fish was faultless, cleaned nicely the fish had a pronounced oiliness and a smooth fatty texture but not to the same extreme as O-toro. 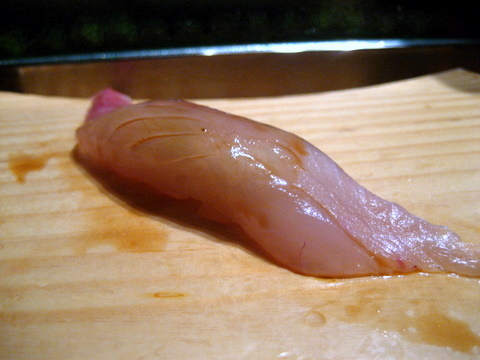 This tends to be one of my favorite fishes with its complex textural character and an oily sweetness. 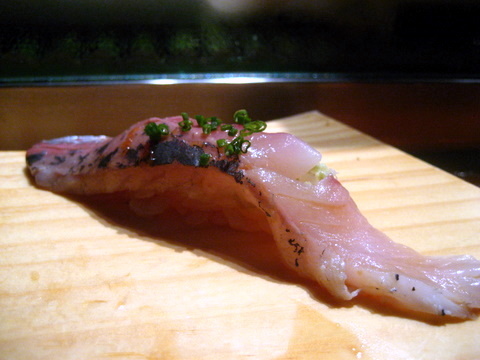 In this single fish fish one can run the gamut of sensations it is possible to experience with raw fish. 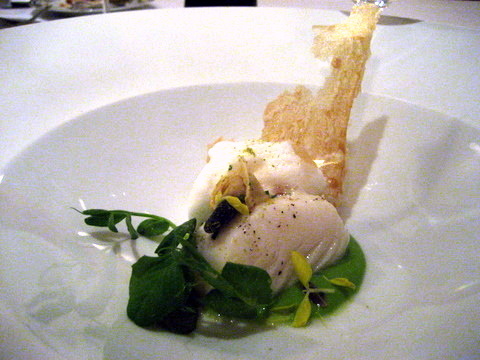 A typical halibut, slightly dry toothsome texture, a bit of citrus or acidity does wonders for this fish. Saba can be a dangerous fish, oily and almost a touch blunt, though the extra large helping of wasabi did help moderate the heaviness somewhat. 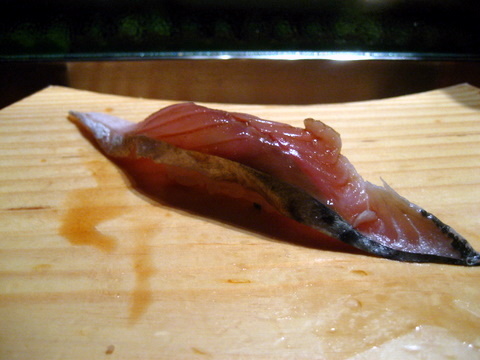 Another oily fish very reminiscent of the saba which is to be expected given that Kohada is a relative of the mackerel. 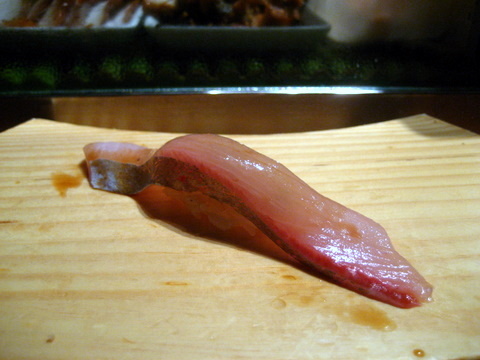 The fish felt a bit drier though the thinner cut made for a more delicate texture. Such a difference between this and the chutoro, oily and gelatainous. The fish oozes richness with every bite. 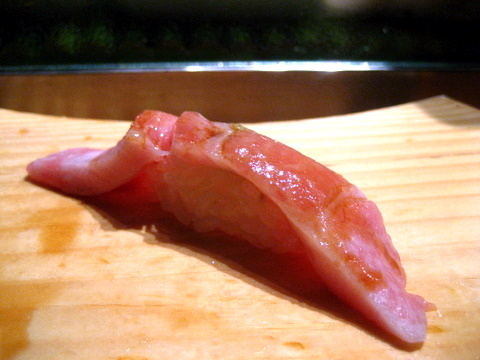 A very high quality toro, served free of any tendon or gristle. 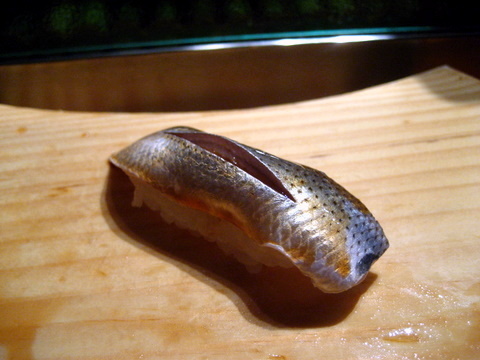 Despite the high quality the fish loses points for appearance, with a very large obvious cut where the itamae removed some of the less desirable parts. In the words of The Simpsons, "it looks as if it has been hacked by a blind woodsman." Same great mackerel taste, less filling. The Aji has a much more nuanced flavor, possessing a rich oiliness but much lighter on the fishy elements, served with a ponzu to give it a sweet acidity. The seared salmon was heavenly, a quick sear gives the fish a smoky complexion that combines with the natural richness of the fish. The heat nearly liquifies the fish allowing the flavor to coat the tongue. 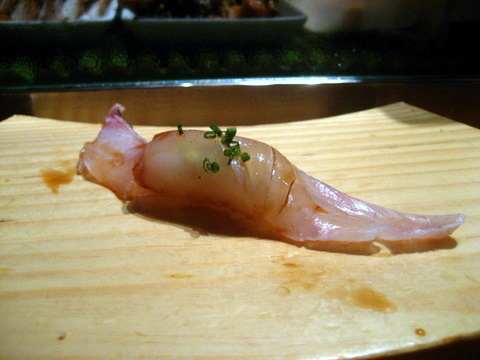 The toro was a bit disappointing as it picked up a strong flavor of gas, such a tragic waste for such a delicious piece of fish. The course felt a bit muddled, the similarities between the various shellfish made it difficult to appreciate the subtle differences between them. Overall, the quality was solid but nothing particularly noteworthy. One of the better preparations of black cod. 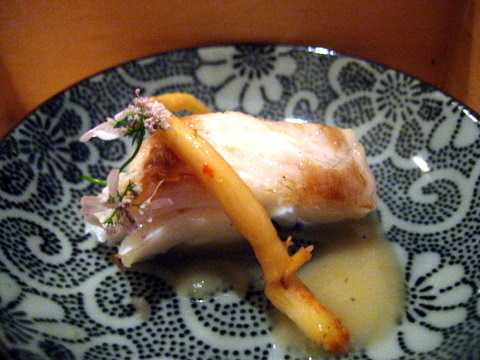 The grilling gives the fish a flavorful char that serves as a backdrop for the pleasing sweetness of the sauce which is balanced by the bitterness of the radish. I really could have done without this course. 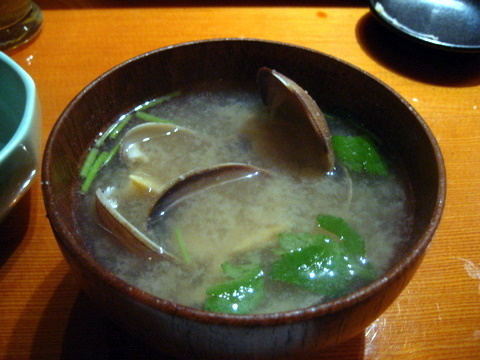 The sweetness of the clam was largely masked by the soup. 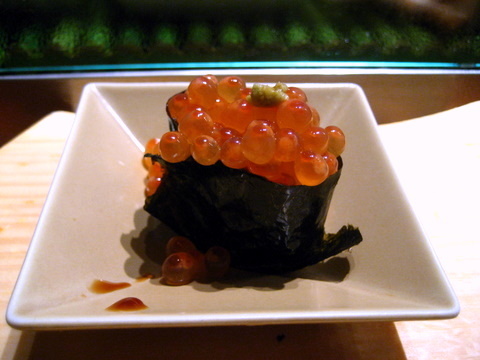 The ikura had a particularly bracing chill and taut texture that exploded releasing a light sweet brine. 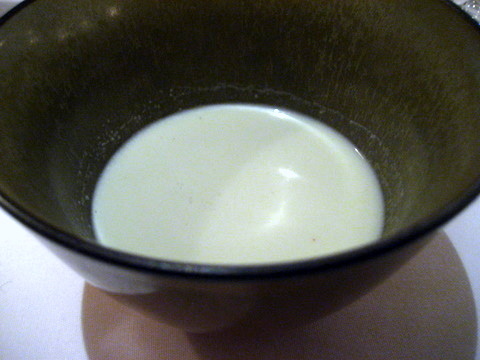 A dollop of wasabi added a short-lived heat to the mix. Unsurprisingly the ikura was followed up with a serving of Uni. 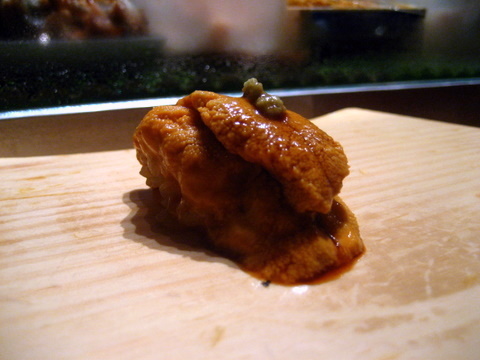 This was one of the few times I have had non-gunkan style uni. 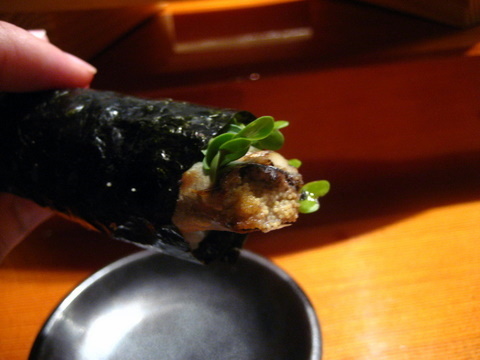 The uni was sweet though a bit monolithic, a crisp wrapping of nori would have been a welcome addition. 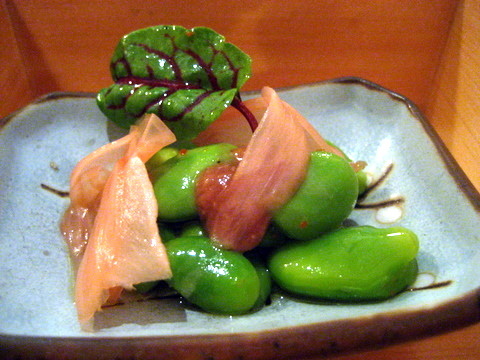 An interesting presentation of chopped toro served with shiso and takuwan (pickled daikon often served at the end of a meal, thought to aid in digestion). 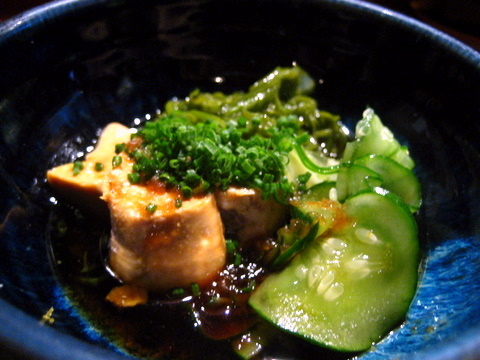 The toro ended up taking a back seat to the sweet fragrance of the shiso and the tangy crunch of the pickle. Not bad but this would have been just as good with maguro. 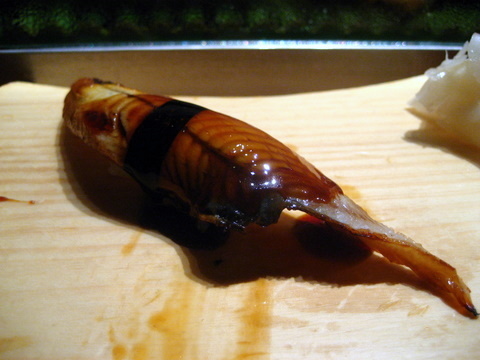 A classic preparation of unagi, the unagi had a tender fatty texture though it came drowning in sticky sweet tsume sauce. 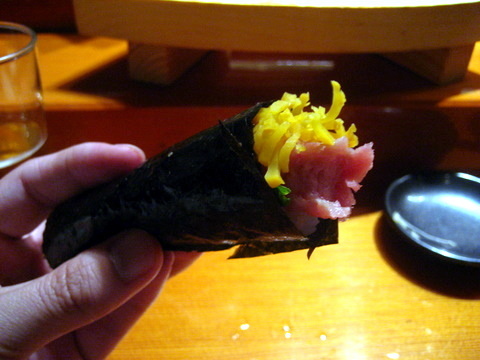 A favorite of mine at Dim Sum restaurants, this is my first time having it served in a hand roll. 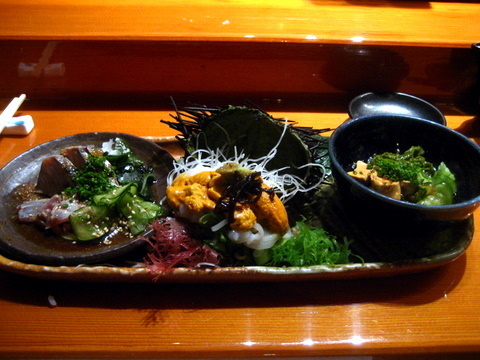 The salty oily flavor of the fish, compliments the rice and seaweed nicely. 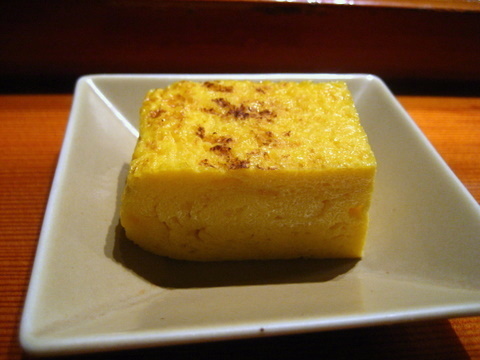 A mediocre preparation of tamago. 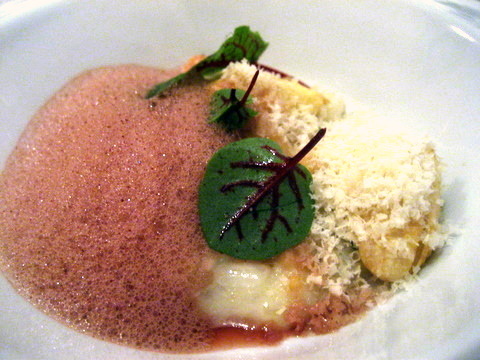 Though the egg had a dense mouthfeel and a well-balanced sweet/savory flavor, there was a slight funk that bothered me. 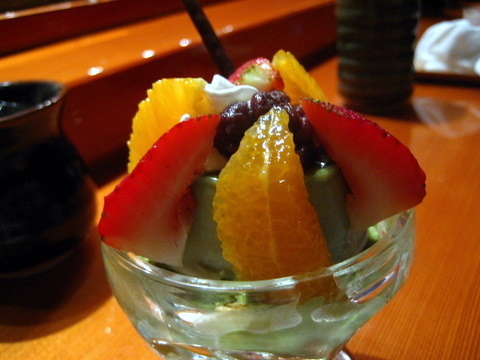 One of the more elaborate desserts I've had at a sushi restaurant though disappointing despite its complexity. The slightly flavor differences of the green tee ice cream and matcha pudding were somewhat unsettling. A simpler straightforward flavor would have been a better choice. For the most part, the quality of the fish at Sushi Sushi is above reproach though a few of the rarer pieces weren't quite up to snuff. 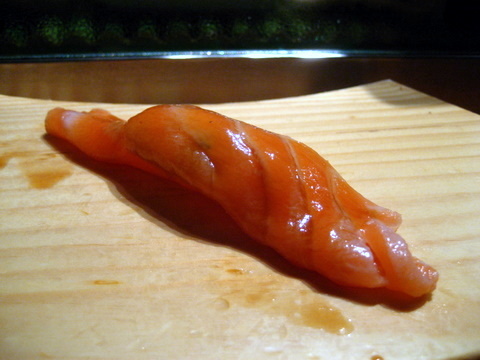 Aside from the oddly sized nigiri, my biggest complaints weren't with the food but rather with the overall experience. The pace of the meal was painfully fast with the entire meal taking less than 90 minutes to complete. 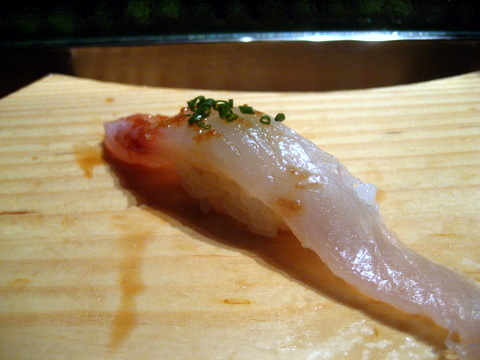 The problem was most noticeable with the nigiri; often one piece would arrive before I'd finished chewing the last one. 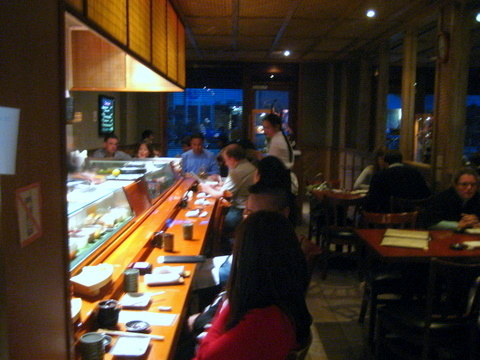 In addition some people have also complained about the itamae not talking to guests at the sushi bar or only repeating the words "sushi sushi." Our chef had a grandfatherly air about him and I got the impression he was quiet by nature. Still, he answered most of my questions and checked on us periodically to see if we were enjoying our meal. On the whole, I enjoyed my experience at Sushi Sushi though I don't think it warrants its place on Yelp as the third best sushi restaurant in LA. Pizzeria Mozza has long been on my list of places to try, even more so after a strong experience at the next door Osteria and glowing reviews from trusted friends. 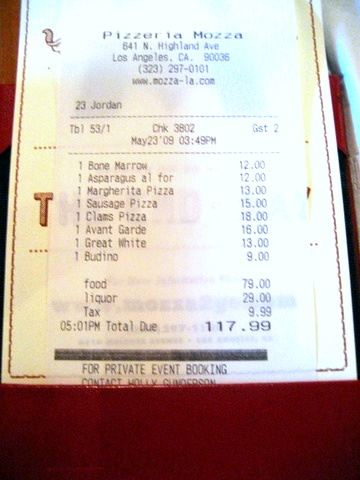 I ended up in LA running an errand so I dragged Kevin along and we ended up having alate lunch/early dinner at Mozza. The restaurant is done up in bright slightly garish colors colors and packed cheek to jowl with functional wooden tables and chairs. Patrons also have the option of dining at a small wine bar, a couple seats overlooking the wood fired oven, or even a private dining room. 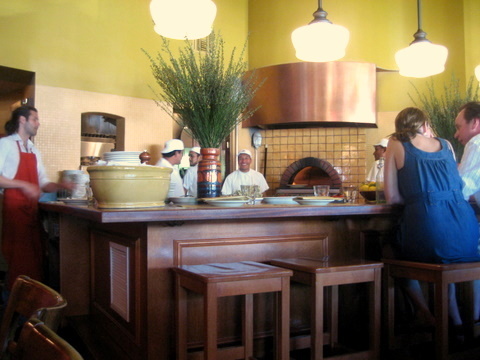 Pizzeria Mozza is one of two restaurants in a joint venture between Nancy Silverton, Mario Batali, and Joseph Bastianich. 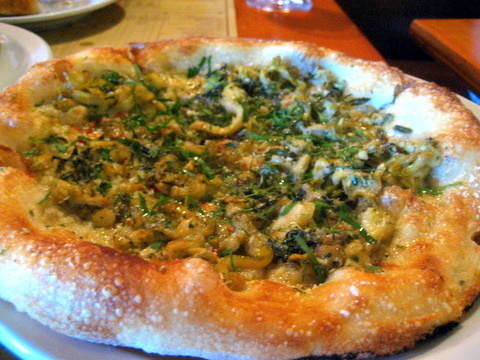 Pizzeria Mozza remains arguably the hottest ticket in LA, even more than its more upscale sibling Osteria Mozza. 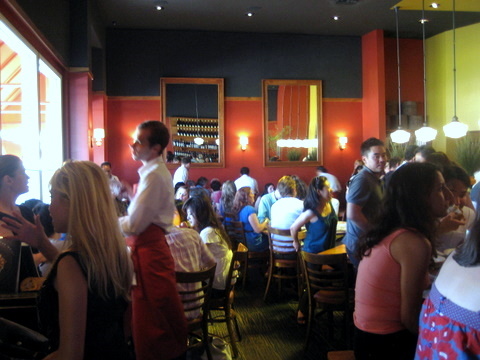 The fact that every table was taken we arrived at 3:45 for our reservation is a testament to the place's popularity. Perhaps the restaurants popularity is due to its versatility, whether an upscale lunch, afternoon snack, or late-night drink at the wine bar. 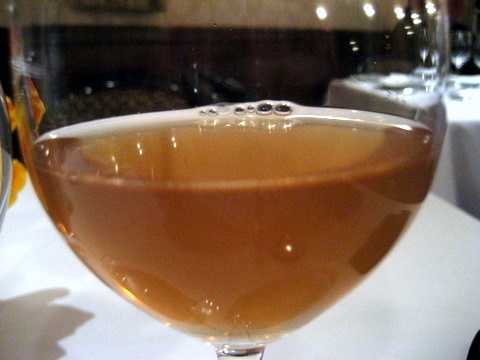 Avant Garde is labeled as a Biere de Garde or "keeping beer." These farmhouse-style beers were brewed in the winter and spring then cellared to be drunk at a later date. This was a fairly dark beer with an aroma of yeasty bread, orange and honey. 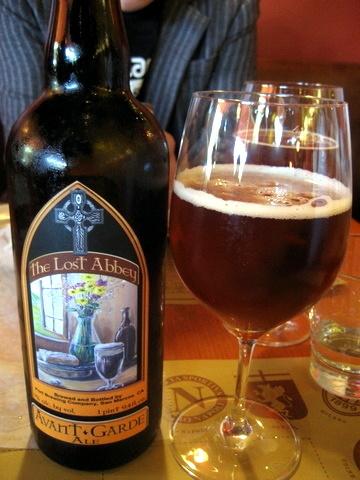 On the palate, the beer tastes of caramel maltiness with a strong orange zest and light floral characters. Kevin aptly described the beer as rustic. 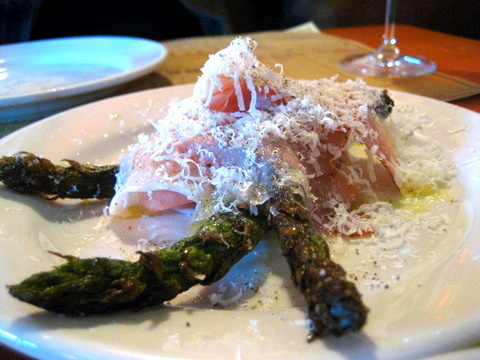 The grilling reduced the asparagus to an semisolid consistency and added a bitter char to the vegetable's natural grassy sweetness. The speck offered a nice textural difference with its tender chewiness and the smoky flavor of the meat provided a savory counterpoint. 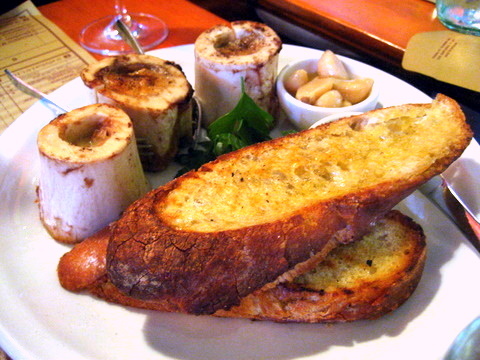 Bone marrow is always a dangerous dish, rich and flavorful it can sometimes feel like eating a stick of butter. On its own Mozza's marrow is a perfect example, tasting like solidified oil. 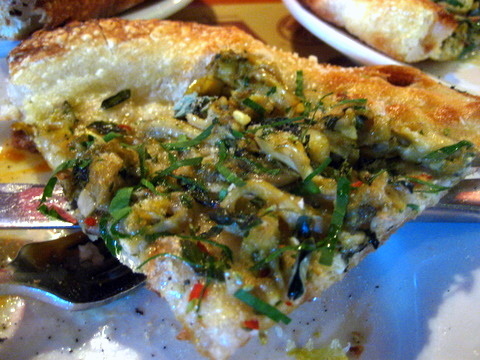 The bread and bitter greens manage the unctuousness of the marrow while leaving behind the rich buttery flavor. 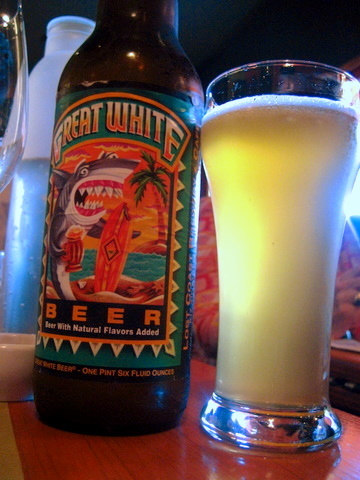 Our second beer was a fairly typical witbier. 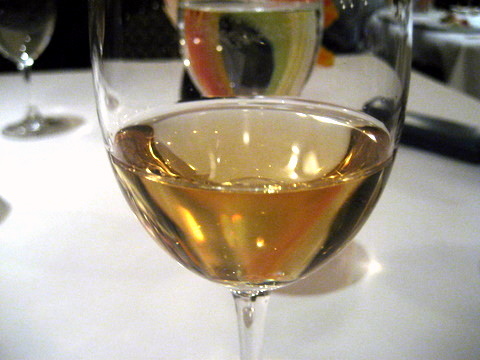 The pour was light blond with a pronounced haziness. On the nose hints of orange and coriander compliment the yeasty wheat. 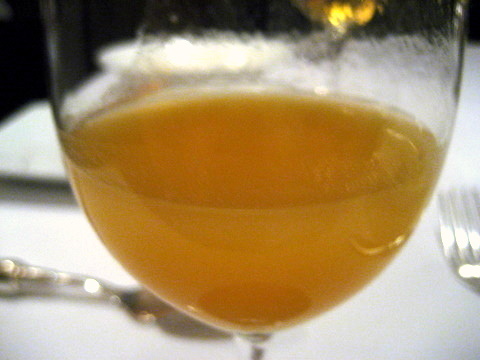 The citrusy tang and soft spices continue on the palate joined by a disconcerting metallic flavor. We had to try the Margherita since it is ubiquitous among the more upscale pizza restaurants and serves as a convenient reference point. 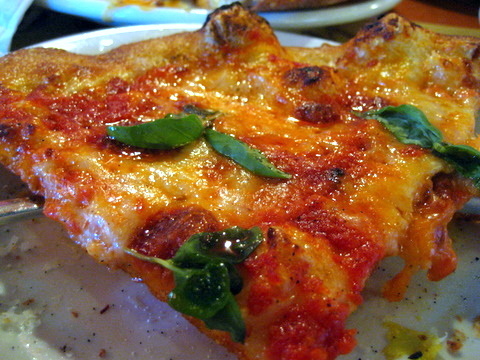 The freshness of the ingredients was apparent in this pizza, very bright tart-sweet tomatoes, fragrant basil, and nicely brined cheese all resting atop a crispy crust. 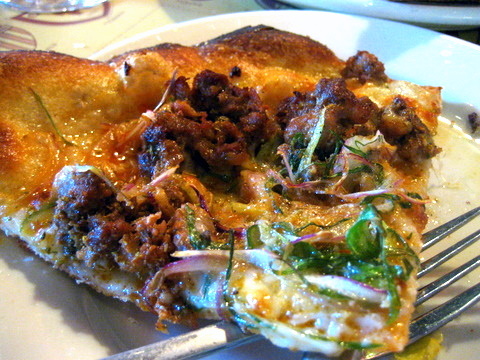 My only complaint was the oiliness of the pizza and this was a problem that carried over to the sausage pizza as well. 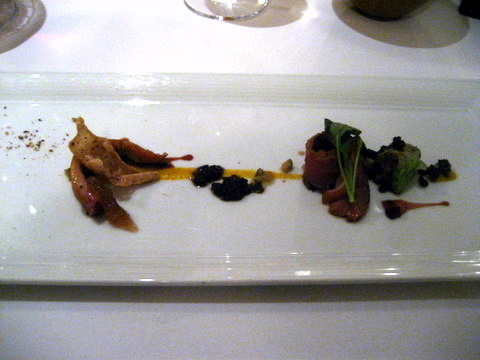 Initially, I tasted a lot of strong distinct flavors which made it a bit hard to really appreciate what I was eating. 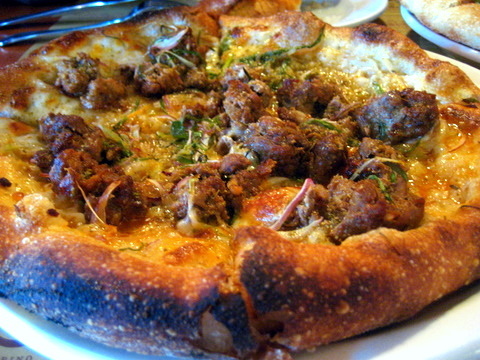 As the pizza cooled, the flavors seemed to temper down leaving the anise tinged sausage as the focal point of the dish. Again my main complaint was the amount of oil I squeezed out of the pizza when I folded it in half. I missed out on the clam pizza at Lombardi's so I felt this would be a good substitute as the ingredients are very similar. Alas the flavors turned out to be a bit blunt, alternating between slightly bitter briney clams and the herbaceous garlic and oregano mixture. An interesting experience but not one I'd care to repeat anytime soon. 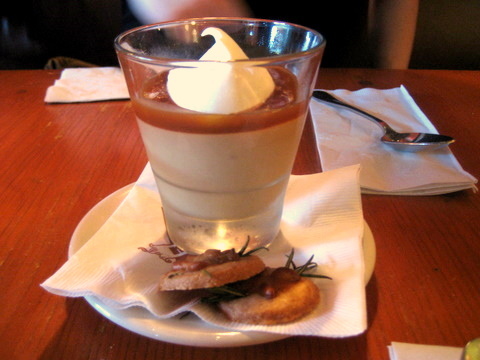 I was told the budino was a can't miss dessert by Christine who threatened bodily harm if we did not try it. The blend of butterscotch and caramel accented with sea salt did not disappoint particularly when finished off with the lingering warmth of the rosemary cookie. So did Mozza live up to the hype? In a word, no. But that is partially due to the fact that the level of buzz around this restaurant is unreal. 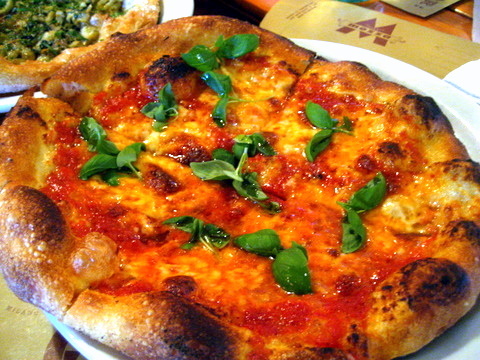 To its credit, Mozza serves up solid pizzas with an array of interesting toppings backed up by strong appetizers and tasty desserts making this a great choice for a casual dinner with friends that is if you can get a seat. 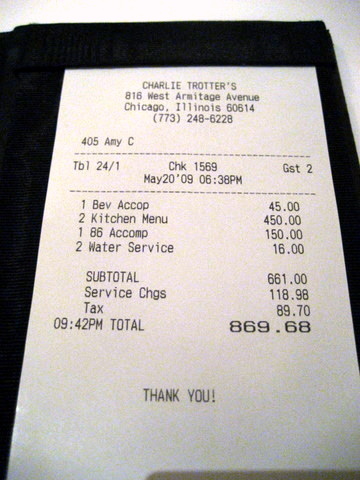 During my very first trip to Chicago, Charlie Trotter's was far and away the best meal of the entire outing and I lamented not getting the Kitchen Table menu. Fortunately I got a chance to correct that grievous error in judgement during my most recent visit to the Windy City. From the outside, the restaurant looks like a cozy country home with an ivy covered brick facade and that feel extends to the interior. Just inside the restaurant is a small bar/waiting area. Beyond that is a hall and flight of stairs that lead to the upstairs dining room. Further in the restaurant is a simply appointed dining room with two rows of tables and a large floral centerpiece, perhaps a touch too simple for such a high-caliber restaurant. First up on the soft drink pairing was Pineapple and Geranium(?) juice. Basically your typical pineapple juice with a slightly salty twist which paired surprisingly well with the raw seafood of the amuses. 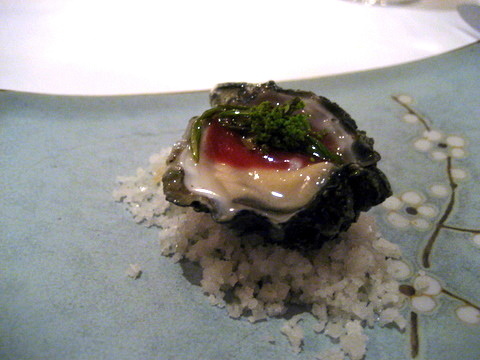 The oyster was a bit leaner than I would like with a slightly chewy texture and a more pungent brine though the stronger flavor was a very effective foil to the bitter Indian celery. 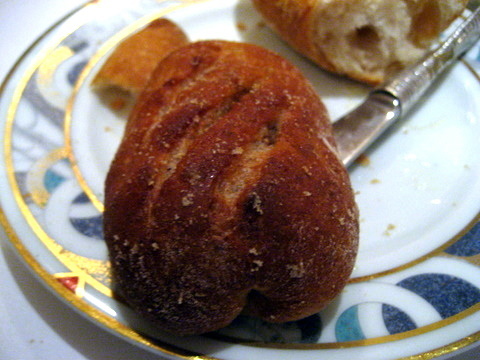 Epi bread is an artisanal bread shaped like the flowering part of a wheat stalk. The shape makes it easy for diner to get pieces of bread without tearing apart the whole loaf. In this case the epi was miniaturized with bite sized pieces instead of whole rolls. 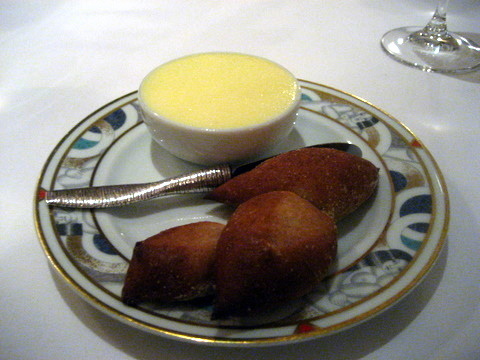 The bread itself was reminiscent of a pretzel and dusted with a light coating of sugar to give it a hint of sweetness. Listed as a tempura this was more of a lightly fried tai, just barely cooked so the flesh remains moist but enough of a sear to give it a nice savoriness. A very well balanced preparation of the fish. 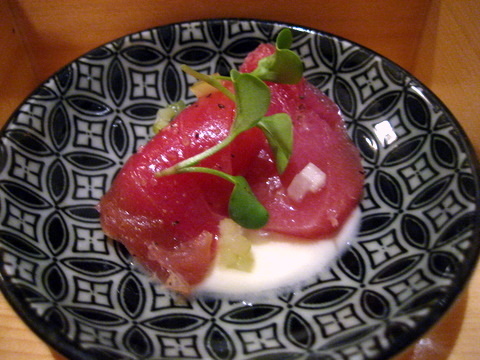 This is my second experience with Kindai tuna, the other was at Tru, interestingly another Chicago restaurant. 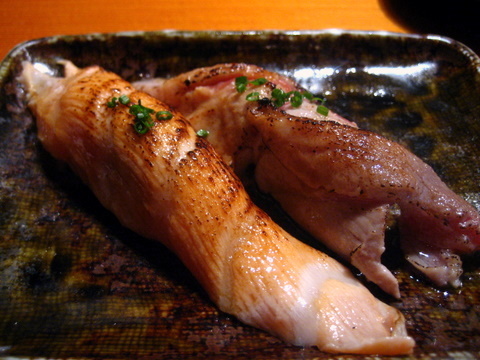 Kindai is a sustainable aquacultured tuna imported in tiny quantities from Japan. 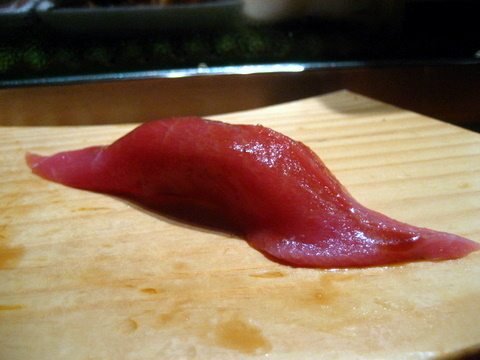 The fish tends to have an oilier softer texture and richer flavor than regular tuna though not quite to the level of toro. One of my favorite fishes and very enjoyable all on its own. Not a huge fan of the beans even less of the chili sauce used to season them. 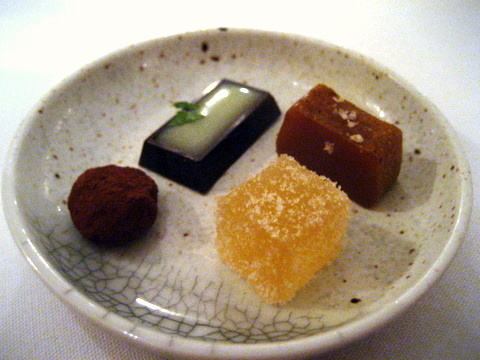 The combination of sweet and salty didn't blend well in this case leaving this dish with no clear direction or focus. Continuing on with popular sushi fish, next we have a freshwater eel. The eel felt a bit denser than normal and had an overt sweetness not only from the banana but the sauce the eel was glazed with as well. Freshwater eel is often served with a sweet sauce so this preparation was in keeping with that tradition but I would have liked more contrasting elements like the cilantro. I was expecting this to be mouth-puckeringly tart but it turned out to be mildly sweet on the palate with complimentary floral notes. 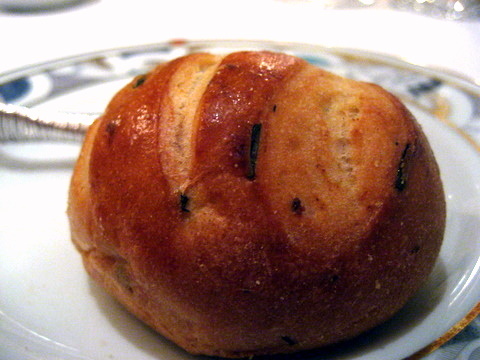 The second bread was a moist warm roll with ricotta and leek. 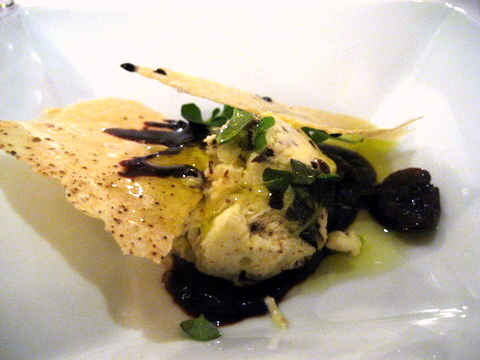 I expected a burst of cheesiness but the bread was surprisingly light, with a hint of chewiness from the ricotta. A nice change of pace having onion as the centerpiece of a dish. The sweetness of the onions laced with fresh herbs made for a lush light salad truly representative of spring. 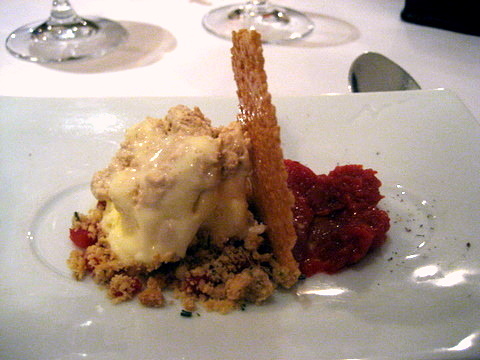 The granita was a bit overwhelming for this dish with its jarring cold temperature and cloying flavor. A vanilla infused cream would have been a much more suitable pairing providing the distinct aroma of the vanilla but more appropriate to the intensity of the other ingredients. 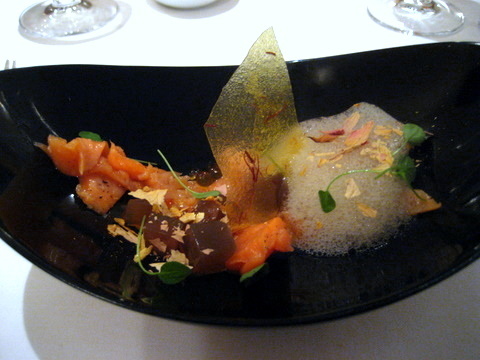 A very tender and flavorful preparations of salmon I have had in a long while. I am not sure what the salmon was immersed in but it seems to have drawn out the natural richness of the fish. The more robust fish stood up well to the paired ikura though I found the sweeter elements of this dish to be distracting. I like to think of this as a Japanese Arnold Palmer, one of the most well designed drinks so far the complex citrus of the yuzu contrasts with the bitterness of the herbal tea quite nicely. A fairly pedestrian soft-shell crab, a bit too salty on its own. The dish also comes with pig's feet or "trotters" which exacerbated the problem. 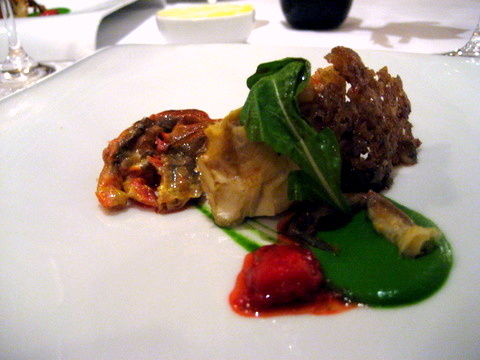 With the strawberry and arugula, the mix takes on a nutty complexion; a nice change though still too one dimensional. I've only ever had fenugreek as a spice, typically mixed in curry. 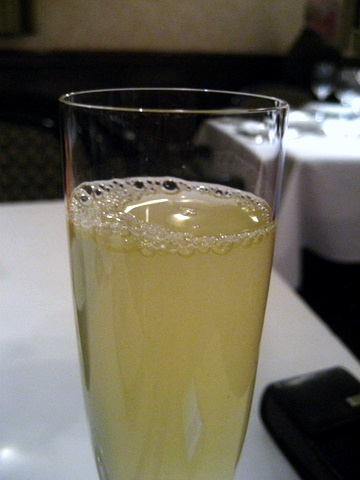 Apparently fenugreek leaves have a distinctive aroma and a bitter taste both found in spades in this drink. 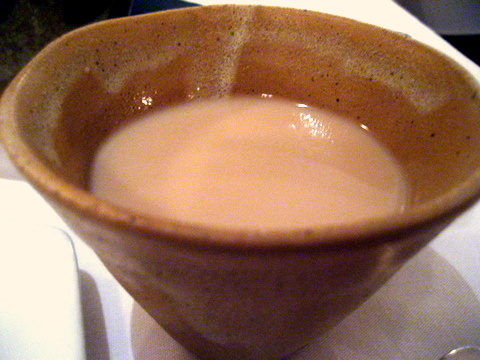 The flavor reminded me a greatly of an herbal medicine as adventurous as it was horrible. A classic French baguette, pleasant but I would have liked something a bit more distinctive. Another strong fish preparation, the halibut was so soft I thought it might break apart on the fork. 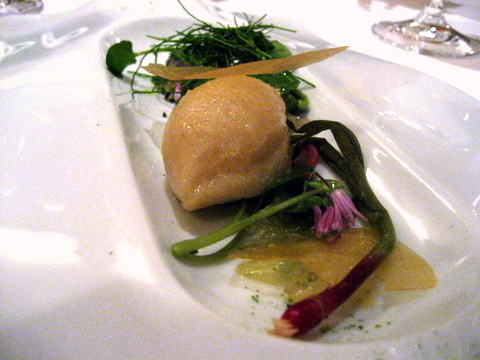 I originally believed the fish was prepared sous vide but our server said it was actually citrus steamed. The fish was served with clams, peas, and ham all contributing to a complex well-seasoned dish, probably my favorite of the night. One of the few non-truffle vegetarian risottos I have had in the past. A very enjoyable multifaceted course despite ultimately being a humble combination of rice and nuts. The creamy risotto provides a base, grounding the smooth nutty flavor of the Marconas and the contrasting grassier flavor of the green almonds. The use of red wine deepens and enriches the preceding ingredients. When our server mentioned what this was I thought it was going to be like a mint raita or tzatziki but this turned out to have a more milky consistency and a slightly chalky flavor. Ah bacon, "teacher, mother, secret lover." 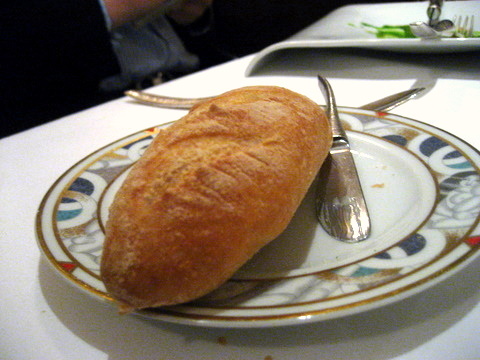 Seriously though this was a rich savory bread that served as a nice lead in to the richer meats that were forthcoming. 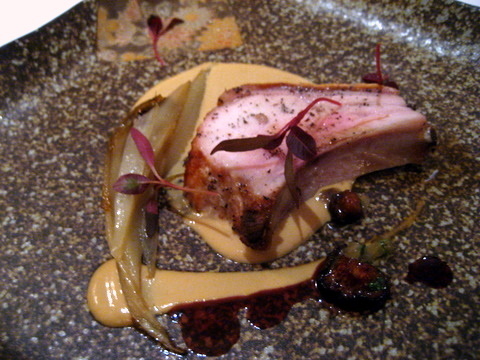 A nice take on the traditional suckling pig, the bitter endives and wild earthy mushroom complimenting the straightforward flavor of the pork. The skin on my pig was stale and hard to the point of being painful to chew. Despite the quality of the meat, the unforgivably poor texture of the skin made this one of the weaker dishes for me. 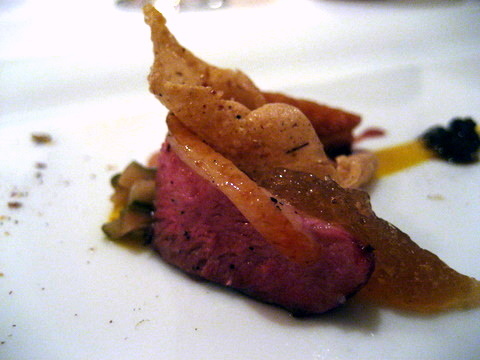 Quintessentially rich duck breast, best on its own or taken with a bit of the orange zest. The organ meat was an interesting touch giving a bitter iron-laced flavor, quite unique but definitely something to use very sparingly. This venison exhibits none of the lean gamy flavor typically associated with deer instead the meat abounds with a sausage like richness. The flavor pairs nicely with the smoky read wine and haunting whisper of spice from the horseradish. 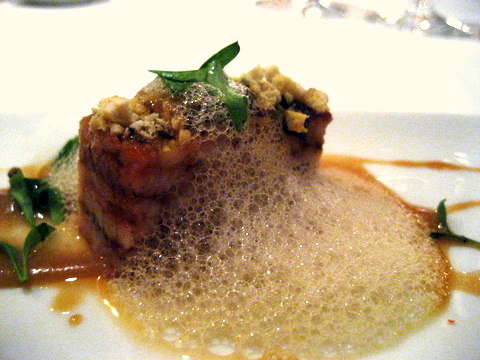 The sweetness of the carrot gave the dish a rustic flavor but also tended to blunt the more nuanced flavors. 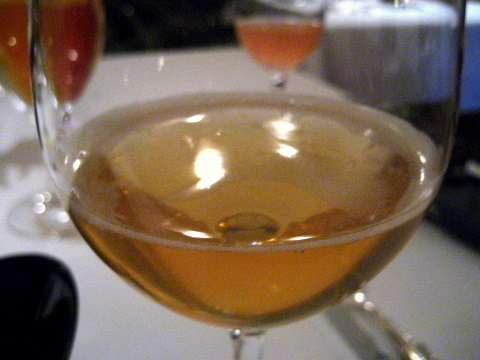 The drink exhibited some of the softer elements of the walnut, with an almost fruity sweetness deftly set off by a hint of thyme. One consistent strong aspect of the night's food has been the texture of the meat. 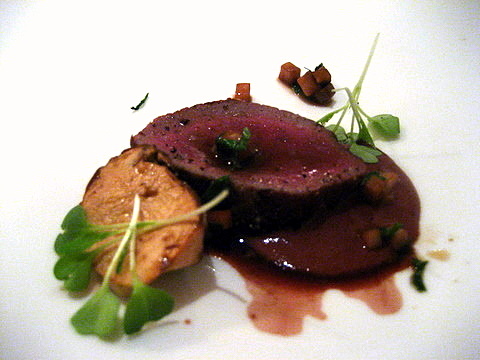 Like venison, bison tends to be a leaner, firmer meat but this rivaled a well prepared steak in terms of mouthfeel. 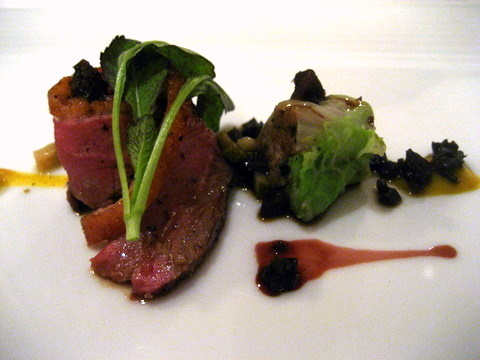 The initial flavor gave me the impression of a preserved meat with a hint of game hidden in the salty smoky depths. 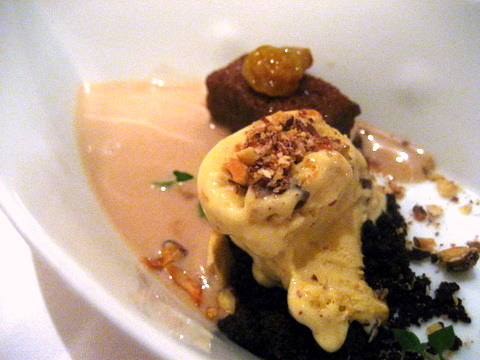 The boudin provided a sweet Autumnal spice, quite apropos for the bison. The candied cilantro provides an alluring sweetness which is mimbly balanced against the bitter acidity of the meringue. Meanwhile the cold refreshes and uplifts the palate, preparing the diner for the last few courses. The sesame ice cream immediately demands attention with its pure concentrated flavor. The quince retained some of its tartness though the cooking gave it something of a round sweetness that meshed well with the ice cream while the shortbread provided a dry textural counterpoint and some heft to the dish. 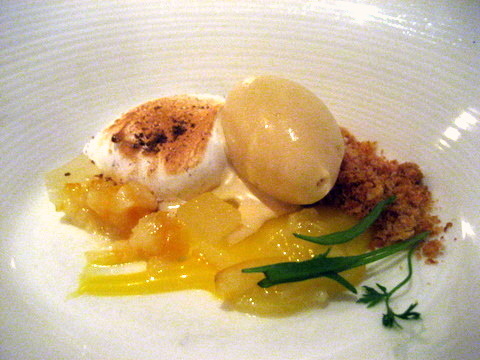 I question the wisdom of following up a frozen citrus meringue with another citrus and meringue pairing. The Meyer lemon was substantially different from the Key lime, with a soft sweetness that harmonized instead of contrasted with the accompaniments. 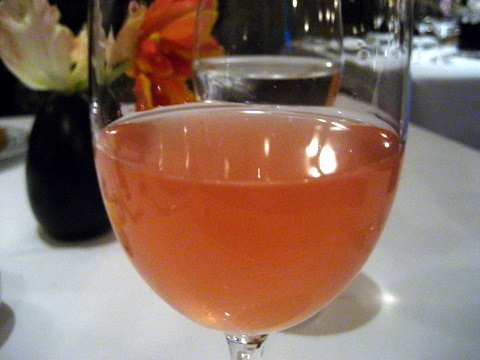 The drink pairing ended with a simple grape juice made by Navarro Vineyards. The juice exhibited hints of stone fruit, and lychee in addition to the simple sweetness, this is definitely not your typical Welsh's grape juice. The olive oil added a nice verdant tinge to the dark chocolate but the two disparate elements muted one another and the resulting amalgam lacked the depth of flavor and complexity of the previous desserts. A lot more going on in this course though a bit disjointed, the nutty cake and the smoky alcholic heat of the sherry didn't quite work for me. 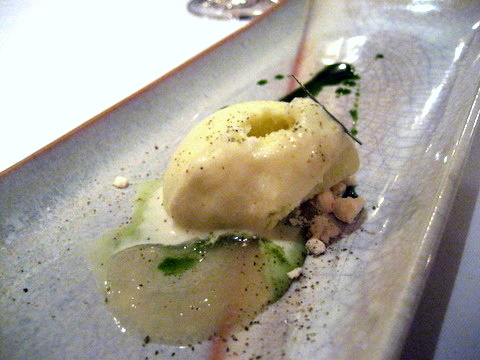 Perhaps being served this in conjunction with the above dessert made it difficult to appreciate either individually. Our server made a game of the mignardises, asking us to guess what each of the pieces was. We ended up getting 2 out of 4 missing both of the chocolates. During my first visit I was impressed at the masterful control of the kitchen, harmony was the watchword and superbly balanced flavor the result. The kitchen table menu seemed to draw from a much wider range of ingredients, and exhibited a surprisingly heavy Japanese influence at the start of the meal. The courses were more complex this time around but the laser-like focus on flavor is less apparent, sacrificed in the name of innovation. Perhaps hoping to recreate the extraordinary experience of my first visit was doomed to fail. Still the Kitchen Table is an excellent meal and reinforces Charlie Trotter's place in the upper echelon of Chicago fine dining.